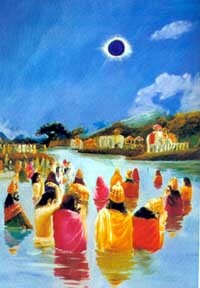 Once upon a time while Lord Krsna and Balarama were living peacefully in Their great city of Dvaraka, there was the rare occasion of a full solar eclipse, such as takes place at the end of every kalpa, or day of Brahma. At the end of every kalpa the sun is covered by a great cloud, and incessant rain covers the lower planetary systems up to Svargaloka. By astronomical calculation, people were informed about this great eclipse prior to its taking place, and therefore everyone, both men and women, decided to assemble at the holy place in Kuruksetra known as Samanta-pancaka. The Samanta-pancaka pilgrimage site is celebrated because Lord Parasurama performed great sacrifices there after having killed all the ksatriyas in the world twenty-one times. Lord Parasurama killed all the ksatriyas, and their accumulated blood flowed like a stream. Lord Parasurama dug five big lakes at Samanta-pancaka and filled them with this blood. Lord Parasurama is visnu-tattva. As stated in the Isopanisad, visnu-tattva cannot be contaminated by any sinful activity. Yet although Lord Parasurama is fully powerful and uncontaminated, in order to exhibit ideal character, He performed great sacrifices at Samanta-pancaka to atone for His so-called sinful killing of the ksatriyas. By His example, Lord Parasurama established that the killing art, although sometimes necessary, is not good. Lord Parasurama considered Himself culpable for the sinful killing of the ksatriyas; therefore, how much more are we culpable for such abominable unsanctioned acts. Thus, killing of living entities is prohibited from time immemorial all over the world. Taking advantage of the occasion of the solar eclipse, all important persons visited the holy place of pilgrimage. Some of the important personalities are mentioned as follows. Among the elderly persons there were Akrura, Vasudeva and Ugrasena; among the younger generation there were Gada, Pradyumna, Samba, and many other members of the Yadu dynasty who had come there with a view to atone for sinful activities accrued in the course of discharging their respective duties. Because almost all the members of the Yadu dynasty went to Kuruksetra, some important personalities, like Aniruddha, the son of Pradyumna, and Krtavarma, the commander-in-chief of the Yadu dynasty, along with Sucandra, Suka and Sarana, remained in Dvaraka to protect the city. All the members of the Yadu dynasty were naturally very beautiful, and yet on this occasion, when they appeared duly decorated with gold necklaces and flower garlands, dressed in valuable clothing and properly armed with their respective weapons, their natural beauty and personalities were a hundred times enhanced. The members of the Yadu dynasty came to Kuruksetra in their gorgeously decorated chariots resembling the airplanes of the demigods, pulled by big horses that moved like the waves of the ocean, and some of them rode on sturdy, stalwart elephants that moved like the clouds in the sky. Their wives were carried on beautiful palanquins by beautiful men whose features resembled those of the Vidyadharas. The entire assembly looked as beautiful as an assembly of the demigods of heaven. After arriving in Kuruksetra, the members of the Yadu dynasty took their baths ceremoniously, with self-control, as enjoined in the sastras, and they observed fasting for the whole period of the eclipse in order to nullify the reactions of their sinful activities. Since it is a Vedic custom to give in charity as much as possible during the hours of the eclipse, the members of the Yadu dynasty distributed many hundreds of cows in charity to the brahmanas. All those cows were fully decorated with nice dress and ornaments. The special feature of these cows was that they had golden ankle bells and flower garlands on their necks. All the members of the Yadu dynasty again took their baths in the lakes created by Lord Parasurama. After this they sumptuously fed the brahmanas with first-class cooked food, all prepared in butter. According to the Vedic system, there are two classes of food. One is called raw food, and the other is called cooked food. Raw food does not include raw vegetables and raw grains, but food boiled in water; whereas cooked food is made in ghee. Capatis, dhal, rice and ordinary vegetables are called raw foods, as are fruits and salads. But puris, kachauris, sangosas, sweet balls, etc., are called cooked foods. All the brahmanas invited on that occasion by the members of the Yadu dynasty were fed sumptuously with cooked food. The ceremonial functions performed by the members of the Yadu dynasty externally resembled the ritualistic performances performed by the karmis. When a karmi performs some ritualistic ceremony, his ambition is sense gratification -- good position, good wife, good house, good children or good wealth; but the ambition of the members of the Yadu dynasty was different. Their ambition was to offer perpetual faith and devotion to Krsna. All the members of the Yadu dynasty were great devotees. As such, after many births of accumulated pious activities, they were given the chance to associate with Lord Krsna. In going to take their baths in the place of pilgrimage at Kuruksetra while observing the regulative principles during the solar eclipse or feeding the brahmanas -- in all their activities -- they simply thought of devotion to Krsna. Their ideal worshipable Lord was Krsna, and no one else. After feeding the brahmanas, it is the custom for the host, with their permission, to accept prasadam. Thus, with the permission of the brahmanas, all the members of the Yadu dynasty took lunch. Then they selected resting places underneath big, shadowy trees, and when they had taken sufficient rest, they prepared to receive visitors, among whom there were relatives and friends, as well as many subordinate kings and rulers. There were the rulers of the Matsya Province, Usinara Province, Kosala Province, Vidarbha Province, Kuru Province, Srnjaya Province, Kamboja Province, Kekaya Province and many other countries and provinces. Some of the rulers belonged to opposing parties, and some were friends. But above all, the visitors from Vrndavana were most prominent. The residents of Vrndavana, headed by Nanda Maharaja, had been living in great anxiety because of separation from Krsna and Balarama. Taking advantage of the solar eclipse, they all came to see their life and soul, Krsna and Balarama. The inhabitants of Vrndavana were well-wishers and intimate friends of the Yadu dynasty. This meeting of the two parties after long separation was a very touching incident. Both the Yadus and the residents of Vrndavana felt such great pleasure in meeting and talking together that it was a unique scene. Meeting after long separation, they were all jubilant; their hearts were throbbing, and their faces appeared like freshly bloomed lotus flowers. There were drops of tears falling from their eyes, the hair on their bodies stood on end, and because of their extreme ecstasy, they were temporarily speechless. In other words, they began to dive in the ocean of happiness. While the men were meeting in that way, the women were also meeting one another in the same manner. They were embracing each other in great friendship, smiling very mildly, and looking at one another with much affection. When they were embracing each other in their arms, the saffron and kunkuma spread on their breasts was exchanged from one person to another, and they all felt heavenly ecstasy. Due to such heart-to-heart embracing, torrents of tears glided down their cheeks. The juniors were offering obeisances to the elders, and the elders were offering their blessings to the juniors. They were thus welcoming one another and asked after each other's welfare. Ultimately, however, all their talk was only of Krsna. All the neighbors and relatives were connected with Lord Krsna's pastimes in this world, and as such Krsna was the center of all their activities. Whatever activities they performed--social, political, religious or conventional--were transcendental. The real elevation of human life rests on knowledge and renunciation. As stated in the Srimad-Bhagavatam, in the First Canto, devotional service rendered to Krsna automatically produces perfect knowledge and renunciation. The family members of the Yadu dynasty and the cowherd men of Vrndavana had their minds fixed on Krsna. That is the symptom of all knowledge, and because their minds were always engaged in Krsna, they were automatically freed from all material activities. This stage of life is called yukta-vairagya as enunciated by Srila Rupa Gosvami. Knowledge and renunciation, therefore, do not mean dry speculation and renunciation of activities. Rather, one must start speaking and acting only in relationship with Krsna. In this meeting at Kuruksetra, Kuntidevi and Vasudeva, who were sister and brother, met after a long period of separation, along with their respective sons and daughters-in-law, wives, children and other family members. By talking among themselves, they soon forgot all their past miseries. Kuntidevi especially addressed her brother Vasudeva as follows: "My dear brother, I am very unfortunate, because not one of my desires has ever been fulfilled; otherwise how could it happen that although I have such a saintly brother as you, perfect in all respects, you did not inquire from me as to how I was passing my days in a distressed condition of life." It appears that Kuntidevi was remembering the miserable days when she had been banished along with her sons through the mischievous plans of Dhrtarastra and Duryodhana. She continued; "My dear brother, I can understand that when Providence goes against someone, even one's nearest relatives also forget him. In such a condition, even one's father, one's mother or one's own children will forget him. Therefore, my dear brother, I do not accuse you." Vasudeva replied to his sister, "My dear sister, do not be sorry, and do not blame me in that way. We should always remember that we all are only toys in the hands of providence. Everyone is under the control of the Supreme Personality of Godhead. It is under His control only that all kinds of fruitive actions and the resultant reactions take place. My dear sister, you know that we were very much harassed by King Kamsa, and by his persecutions we were scattered here and there. We were always full of anxieties. Only in the last few days have we returned to our own places, by the grace of God." After this conversation, Vasudeva and Ugrasena received the kings who came to see them, and they sufficiently welcomed them all. Seeing Lord Krsna present on the spot, all the visitors felt transcendental pleasure and became very peaceful. Some of the prominent visitors were as follows: Bhismadeva, Dronacarya, Dhrtarastra, Duryodhana, and Gandhari along with her sons; King Yudhisthira along with his wife, and the Pandavas along with Kunti; Sanjaya, Vidura, Krpacarya, Kuntibhoja, Virata, King Nagnajit, Purujit, Drupada, Salya, Dhrstaketu, the King of Kasi, Damaghosa, Visalaksa, the King of Mithila, the King of Madras (formerly known as Madra), the King of Kekaya, Yudhamanyu, Susarma, Bahlika along with his sons, and many other rulers who were subordinate to King Yudhisthira. When they saw Lord Krsna with His thousands of queens, they became fully satisfied at the sight of such beauty and transcendental opulence. All who were there personally visited Lord Balarama and Krsna, and being properly welcomed by the Lord they began to glorify the members of the Yadu dynasty, especially Krsna and Balarama. Because he was the King of the Bhojas, Ugrasena was considered the chief Yadu, and therefore the visitors specifically addressed him: "Your Majesty Ugrasena, King of the Bhojas, factually the Yadus are the only persons within this world who are perfect in all respects. All glories unto you! All glories unto you! The specific condition of your perfection is that you are always seeing Lord Krsna, who is sought after by many mystic yogis undergoing severe austerities and penances for great numbers of years. All of you are in direct touch with Lord Krsna at every moment. "All the Vedic hymns are glorifying the Supreme Personality of Godhead, Krsna. The Ganges water is considered sanctified because of its being the water used to wash the lotus feet of Lord Krsna. The Vedic literatures are nothing but the injunctions of Lord Krsna. The purpose of the study of all the Vedas is to know Krsna; therefore, the words of Krsna and the message of His pastimes are always purifying. By the influence of time and circumstances, all the opulences of this world had become almost completely wiped out, but since Krsna has appeared on this planet, all auspicious features have again appeared due to the touch of His lotus feet. Because of His presence, all our ambitions and desires are gradually being fulfilled. Your Majesty, King of the Bhojas, you are related with the Yadu dynasty by matrimonial relationship, and by blood relationship also. As a result, you are constantly in touch with Lord Krsna, and you have no difficulty in seeing Him at any time. Lord Krsna moves with you, talks with you, sits with you, rests with you, and dines with you. The Yadus appear to be always engaged in worldly affairs which are considered to lead to royal road to hell, but due to the presence of Lord Krsna, the original Personality of Godhead in the Visnu category, who is omniscient, omnipresent and omnipotent, all of you are factually relieved from all material contamination, and are situated in the transcendental position of liberation and Brahman existence." When they had heard that Krsna would be present in Kuruksetra because of the solar eclipse, the residents of Vrndavana, headed by Maharaja Nanda, had also decided to go there, and therefore all the members of the Yadu dynasty were attending. King Nanda, accompanied by his cowherd men, had loaded all their necessary paraphernalia on bullock carts, and all of the Vrndavana residents had come to Kuruksetra to see their beloved sons Lord Balarama and Lord Krsna. When the cowherd men of Vrndavana arrived in Kuruksetra, all the members of the Yadu dynasty became most pleased. As soon as they saw the residents of Vrndavana, they stood up to welcome them, and it appeared that they had again regained their life. Both had been very eager to meet, and when they actually came forward and met, they embraced one another to their heart's satisfaction and remained in embrace for a considerable time. As soon as Vasudeva saw Nanda Maharaja, he jumped and ran over to him and embraced him very affectionately. Vasudeva began to narrate his past history--how he had been imprisoned by King Kamsa, how his babies had been killed, and how immediately after Krsna's birth he had carried Him to the place of Nanda Maharaja, and how Krsna and Balarama had been raised by Nanda Maharaja and his queen, Yasoda, as their own children. Similarly, Lord Balarama and Krsna also embraced King Nanda and mother Yasoda and then offered Their respect unto their lotus feet by bowing down. Because of Their feeling affection for Nanda and Yasoda, both Lord Krsna and Balarama became choked up, and for a few seconds They could not speak. The most fortunate King Nanda and mother Yasoda placed their sons on their laps and began to embrace Them to their full satisfaction. Because of separation from Krsna and Balarama, both King Nanda and Yasoda had been merged in great distress for a very long time. Now, after meeting Them and embracing Them, all their sufferings were mitigated. After this, Krsna's mother, Devaki, and Balarama's mother, Rohini, both embraced mother Yasoda. They said, "Dear Queen Yasodadevi, both you and Nanda Maharaja have been great friends to us, and when we remember you we are immediately overwhelmed by the thought of your friendly activities. We are so indebted to you that even if we were to return your benediction by giving you the opulence of the King of heaven, it would not be enough to repay you for your friendly behavior. We shall never forget your kindly behavior toward us. When both Krsna and Balarama were born, before They even saw Their real father and mother, They were entrusted to your care, and you raised Them as your own children, fostering Them as birds take care of their offspring in the nest. You have nicely fed, nourished and loved Them and have performed many auspicious religious ceremonies for Their benefit. "Actually They are not our sons; They belong to you. Nanda Maharaja and yourself are the real father and mother of Krsna and Balarama. As long as They were under your care They had not even a pinch of difficulty. Under your protection, They were completely out of the way of all kinds of fear. This most affectionate care which you have taken for Them is completely befitting your elevated position. The most noble personalities do not discriminate between their own sons and the sons of others, and there cannot be any personalities more noble than Nanda Maharaja and yourself." As far as the gopis of Vrndavana were concerned, from the very beginning of their lives, they did not know anything beyond Krsna. Krsna and Balarama were their life and soul. The gopis were so attached to Krsna that they could not even tolerate not seeing Him momentarily when their eyelids blinked and impeded their vision. They condemned Brahma, the creator of the body, because he foolishly made eyelids which blinked and checked their seeing Krsna. Because they had been separated from Krsna for so many years, the gopis, having come along with Nanda Maharaja and mother Yasoda, felt intense ecstasy in seeing Krsna. No one can even imagine how anxious the gopis were to see Krsna again. As soon as Krsna became visible to them, they took Him inside their hearts through their eyes and embraced Him to their full satisfaction. Even though they were embracing Krsna only mentally, they became so ecstatic and overwhelmed with joy that for the time being they completely forgot themselves. The ecstatic trance which they achieved simply by mentally embracing Krsna is impossible to achieve even for great yogis constantly engaged in meditation on the Supreme Personality of Godhead. Krsna could understand that the gopis were rapt in ecstasy by embracing Him in their minds, and therefore, since He is present in everyone's heart, He also reciprocated the embracing from within. Krsna was sitting with mother Yasoda and His other mothers, Devaki and Rohini, but when the mothers engaged in talking, He took the opportunity and went to a secluded place to meet the gopis. As soon as He approached the gopis, the Lord began to smile, and after embracing them and inquiring about their welfare, He began to encourage them, saying, "My dear friends, you know that both Lord Balarama and Myself left Vrndavana just to please Our relatives and family members. Thus We were long engaged in fighting with Our enemies and were obliged to forget you, who were so much attached to Me in love and affection. I can understand that by this action I have been ungrateful to you, but still I know you are faithful to Me. May I inquire if you have been thinking of Us although We had to leave you behind? My dear gopis, do you now dislike remembering Me, considering Me to have been ungrateful to you? Do you take My misbehavior with you very seriously? "After all, you should know it was not My intention to leave you; our separation was ordained by Providence, who after all is the supreme controller and does as He desires. He causes the intermingling of different persons, and again disperses them as He desires. Sometimes we see that due to the presence of clouds and strong wind, atomic particles of dust and broken pieces of cotton are intermingled together, and after the strong wind subsides, all the particles of dust and cotton are again separated, scattered in different places. Similarly, the Supreme Lord is the creator of everything. The objects which we see are different manifestations of His energy. By His supreme will we are sometimes united and sometimes separated. We can therefore conclude that ultimately we are absolutely dependent on His will. "Fortunately, you have developed loving affection for Me, which is the only way to achieve the transcendental position of association with Me. Any living entity who develops such unalloyed devotional affection for Me certainly at the end goes back to home, back to Godhead. In other words, unalloyed devotional service and affection for Me are the cause of supreme liberation. "My dear gopi friends, you may know from Me that it is My energies only which are acting everywhere. Take, for example, an earthen pot. It is nothing but a combination of earth, water, air, fire and sky. It is always of the same physical composites, whether in its beginning, during its existence or after its annihilation. When it is created, the earthen pot is made of earth, water, fire, air and sky; while it remains, it is the same in composition; and when it is broken and annihilated, its different ingredients are conserved in different parts of the material energy. Similarly, at the creation of this cosmic manifestation, during its maintenance, and after its dissolution, everything is but a different manifestation of My energy. And because the energy is not separate from Me, it is to be concluded that I am existing in everything. "In the same way, the body of a living being is nothing but a composition of the five elements, and the living entity embodied in the material condition is also part and parcel of Me. The living entity is imprisoned in the material condition on account of his false conception of himself as the supreme enjoyer. This false ego of the living entity is the cause of his imprisonment in material existence. As the Supreme Absolute Truth, I am transcendental to the living entity, as well as to his material embodiment. The two energies, material and spiritual, are both acting under My supreme control. My dear gopis, I request that instead of being so afflicted, you try to accept everything with a philosophical attitude. Then you will understand that you are always with Me and that there is no cause of lamentation in our being separated from one another." This important instruction of Lord Krsna's to the gopis can be utilized by all devotees engaged in Krsna consciousness. The whole philosophy is considered on the basis of inconceivable, simultaneous oneness and difference. In Bhagavad-gita the Lord says that He is present everywhere in His impersonal feature. Everything is existing in Him, but still He is not personally present everywhere. The cosmic manifestation is nothing but a display of Krsna's energy, and because the energy is not different from the energetic, nothing is different from Krsna. When this absolute consciousness, Krsna consciousness, is absent, we are separated from Krsna; but fortunately, if this Krsna consciousness is present, then we are not separated from Krsna. The process of devotional service is the revival of Krsna consciousness, and if the devotee is fortunate enough to understand that the material energy is not separate from Krsna, then he can utilize the material energy and its products in the service of the Lord. But in the absence of Krsna consciousness, the forgetful living entity, although part and parcel of Krsna, falsely puts himself in the position of enjoyer of the material world and, being thus implicated in material entanglement, is forced by the material energy to continue his material existence. This is also confirmed in the Bhagavad-gita. Although a living entity is forced to act by the material energy, he falsely thinks that he is the all-in-all and the supreme enjoyer. If the devotee knows perfectly that the arca-vigraha, or Deity form of Lord Krsna in the temple, is exactly the same sac-cid-ananda-vigraha as Krsna Himself, then his service to the temple Deity becomes direct service to the Supreme Personality of Godhead. Similarly, the temple itself, the temple paraphernalia and the food offered to the Deity are also not separate from Krsna. One has to follow the rules and regulations prescribed by the acaryas, and thus, under superior guidance, Krsna-realization is fully possible, even in this material existence. The gopis, having been instructed by Krsna in this philosophy of simultaneous oneness and difference, remained always in Krsna consciousness and thus became liberated from all material contamination. The consciousness of the living entity who falsely presents himself as the enjoyer of the material world is called jiva-kosa, which means imprisonment by the false ego. Not only the gopis but anyone who follows these instructions of Krsna becomes immediately freed from the jiva-kosa imprisonment. A person in full Krsna consciousness is always liberated from false egoism; he utilizes everything for Krsna's service and is not at any time separated from Krsna. The gopis therefore prayed to Krsna, "Dear Krsna, from Your navel emanated the original lotus flower which is the birthsite of Brahma, the creator. No one can estimate Your glories or Your opulence, which therefore remain always a mystery even to the highest thoughtful men, the masters of all yogic power. The conditioned soul fallen in the dark well of this material existence can very easily, however, take shelter of the lotus feet of Lord Krsna. Thus his deliverance is guaranteed." The gopis continued: "Dear Krsna, we are always busy in our family affairs. We therefore request that You remain within our hearts as the rising sun, and that will be Your greatest benediction." The gopis are always liberated souls, because they are fully in Krsna consciousness. They only pretended to be entangled in household affairs in Vrndavana. In spite of their long separation, the inhabitants of Vrndavana, the gopis, were not interested in the idea of going with Krsna to His capital city, Dvaraka. They wanted to remain busy in Vrndavana and thus feel the presence of Krsna in every step of their lives. They immediately invited Krsna to come back to Vrndavana. This transcendental emotional existence of the gopis is the basic principle of Lord Caitanya's teaching. The Ratha-yatra festival observed by Lord Caitanya is the emotional process of taking Krsna back to Vrndavana. Srimati Radharani refused to go with Krsna to Dvaraka to enjoy His company in the atmosphere of royal opulence, for She wanted to enjoy His company in the original Vrndavana atmosphere. Lord Krsna, being profoundly attached to the gopis, never goes away from Vrndavana, and the gopis and other residents of Vrndavana remain fully satisfied in Krsna consciousness. Thus ends the Bhaktivedanta purport of the Eighty-second Chapter of Krsna, "Lord Krsna and Balarama Meet the Inhabitants of Vrndavana."